Is It Chili in Cincinnati? I subscribe to a few different weekly e-newsletters so that I can keep up with trends and have a constant reminder of food in my back pocket at all times (I have a BlackBerry). Allrecipes.com, The Splendid Table, and America's Test Kitchen are all I subscribe to, but there are plenty of tips, tricks, and trades between the three of them to keep me rolling in dough (and salt, butter, spices, but not all at the same time. It tends to get a bit messy) for years to come. 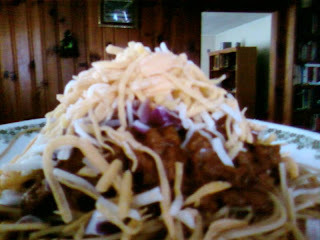 I was introduced to Cincinnati chili recently at a restaurant in Greensboro, NC called Cincy's. Apparently it's sold in a can in Cincinnati-based grocery store, Kroger and made-to-order at a few choice fast-food restaurants in the 'Nati. It's Greek in origin--two Greek families immigrated to Ohio in the early 1900s and perfected recipes, opened chains of restaurants, and the rest is history. If you don't want spaghetti, you are to order "a coney." It's a hot dog with all of the aforementioned toppings. Did I forget to mention oyster crackers? Yes, most servings of this regional delight are served with oyster crackers so you can crumble them over the top. I love oyster crackers, but the cheese and onions are enough for me. Today's e-letter from America's Test Kitchen reminded me of a promise I made to post some lacto-ovo vegetarian recipes. 1. Heat oil in a dutch oven or heavy-bottomed pot over medium-high heat until shimmering. Cook onions until soft and browned around edges. 2. Add garlic, tomato paste, chili powder, oregano, cinnamon, salt & pepper, to taste. Cook until fragrant. 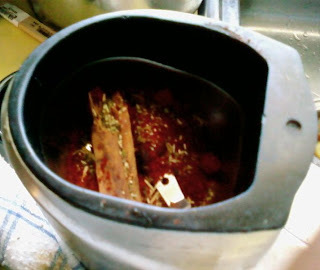 I took it upon myself to grind my own spices together. I heard some people add cocoa powder to the spice mixture too. This would lend a richer, deeper texture to the chili. 3. Stir in chicken broth, tomato sauce, vinegar, and brown sugar. 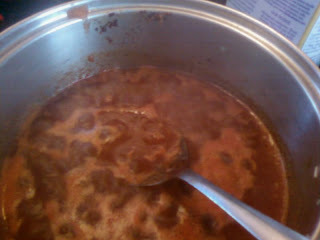 The chili is supposed to be watery, not thick like we're used to with meaty (or bean-y) chilies. 4. Add Boca crumbles, bring to boil, reduce heat to medium-low, and simmer until chili is slightly thickened. Add salt and pepper to taste. At this point, the chili can be refrigerated in an airtight container for up to 3 days or frozen up to 2 months. Pretend the onions aren't there, and that's a two-way. I reckon this would be the portion of the program called product placement, but I just want to make sure you know what you're looking for in the grocery store when you attempt this recipe as written. **Attention Meat Eaters: One pound (or a 1 1/2 lb if you wish) of ground meat should be added instead of the crumbles in step #4. Use the leanest ground beef you can find. Otherwise, the resulting chili will have undesirable pockets of fat that have to be skimmed off and that's just not cute. Increase the vegetable/chicken broth to 1 1/2 cups and break up the meat add you put it in the pot. I love a good coney. My husband is from Ohio and I really want to try the Cincinnati chili! Yours looks delish. 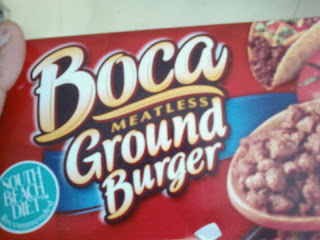 Thank your for thinking of use vegetarians, we do appreciate it! I have not yet made the cornmeal grilled cheese but will definitely do so. Your posts are a lot of fun to read! Lisa: I have much veneration for vegetarians. I do hope that you or someone else like you can enjoy this recipe. I'm glad you enjoy my posts, Lisa! I eally put a lot into them. I'll have to try this one before the days start to get warmer up here. Thank you so much for the sweet comments you left on my blog. Your blog looks great; it's NOT chilly here in Texas today, but chili still sounds good to me. And what a great idea to put it over pasta. I never thought of that. I'll definitely visit your blog again in the future :o). Ben: pumpkin chili? That's a new one. I'll have to explore that before it gets too warm here in North Carolina, too. Chocolatecoveredvegan: I'm glad you stopped by! I have been to Cincy and experienced a "Coney". Good stuff! 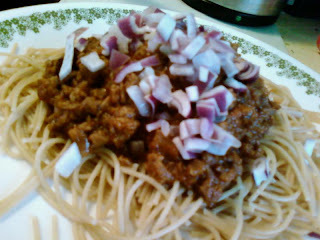 I have to admit, I was a bit taken with the chili over spaghetti though. Being from Philly, spaghetti was always served with a ragu. MrOrph: I'm originally from Philly too! I really don't get the whole spaghetti thing, but I'm not going to complain. It is really good. I have heard of Cincinnati Chili but never knew exactly what it was. Over spaghetti with cheese... DH will be all over that one! Somehow, though, I have a difficult time thinking of eating chili without cornbread. Ben, I have had pumpkin chili in Circleville, too! A very interesting and good taste (amazingly enough). Hi! Thanks so much for your comments on my blog :) I am so relieved to hear your catering experiences mirror mine- I was such a nervous wreck! All's well that ends well, though. Love this post on chili- I saw a Bourdain episode where he had some cincinnati chili and it looked devine-cant wait to try this! With a father from Cincinnati I have a big soft spot for their sweet spiced chili. Thanks for the recipe.